This approximately 15 mile road takes you between Pāhala and Nā'ālehu on the top of the 2,000 foot pali (hill) that you see from the highway. This is a beautiful drive through fields, meadows, pastures, Koa and Kukui forests, lush green cinder cones, and offers breathtaking views of the ocean and land 2,000 feet below you. I wanted to let you know that the last mile, the dirt road, was tough. 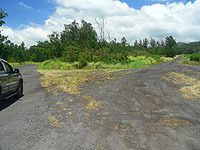 The Instant Hawaii trip description states that the dirt road is in good condition, is as wide as the paved road and that no car should have any problem on this part of the trip. Our experience was: - the road is not in good condition; our Honda bottomed-out four times on track peaks that would require a high clearance vehicle to clear. 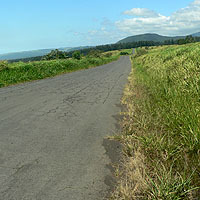 - the road is narrow; we had to share width for vehicles coming up from Naalehu. Unless you are familiar with this road, do not take this road at night or during storms, heavy rain or any other unfavorable conditions. This drive, as a scenic drive, should only be done during beautiful sunny weather. 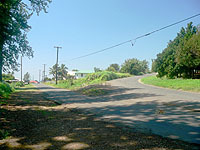 Portions of this road, especially on the Pāhala side, go through an agri-business. You may see signs that say you require permission - though we doubt that you would be stopped unless you were doing something very suspicious. As there are many homes and businesses along this road, all the way from Pāhala to Nā'ālehu lots of people take this to get home, to work, or to visit friends. 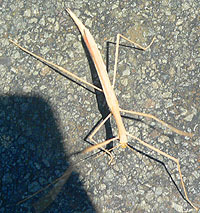 The main road does not require 4-wheel or any clearance, but you will find many side roads do. 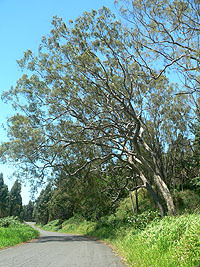 Many of these side roads go through acres of Koa forests or pasture land. We would recommend first, to be cautious on any side roads as the ownership of the land and road is often unknown. Also, most side roads require clearance or 4-wheel drive - do all side road driving with caution. For the most part we encourage you to stay on the main road. I know we already mentioned it above, but do not do this road during heavy rain. There are a couple of places where the road crosses low-lying streambeds - and during heavy rain these streambeds overflow, flood, and often wash out the bridge. Drive with caution over any bridge or through any streambed. First, this drive would be perfect from either direction. 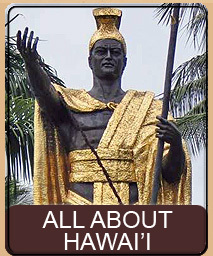 In this write-up we are going to start in Pāhala and end up in Nā'ālehu - but we encourage you to do this drive both directions - mainly because you will see totally different sights in each direction. 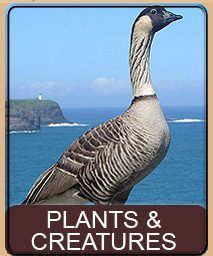 If you are going to follow our directions in this write-up, we start in Pāhala. 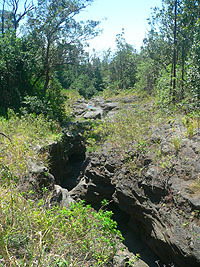 Take Highway 11 to the town of Pāhala, which has only one major entrance from the highway. Turn on Kamani and go to the stop sign (on your left will be a bank and a Tex Restaurant). Turn right at the stop sign and go about 3/10's of a mile at which point the road you are on goes from rough paved to dirt. Right at that point (3/10's of a mile) is a paved side road that heads up. This road is at a very sharp angle to the road you are on so you might miss it. Basically, once you hit dirt you just passed the angled road. Take the angled, paved road and set your odometer. 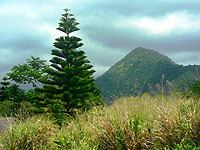 Continue on this road, as it takes you up above Pāhala. 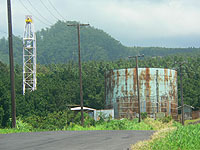 A side road, off to your right, leads past some water tanks in the distance. Take this side road and continue past the water tanks. 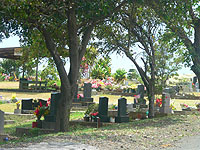 If you are going to do this drive backwards, go into the town of Nā'ālehu and in the middle of the town, on the mauka (mountain) side of the road is a side road with a sign reading Nā'ālehu Cemetery. Make this turn and follow the road to the cemetery. At the point where the road turns left and goes alongside the cemetery, avoid the left turn and continue straight on the dirt road. It will go up an embankment and then over a cemented streambed and then up a mildly steep dirt hill (no problems). You are now at the end of the drive and simply follow this write-up backwards. Once you turn onto the paved sharp left you are on agri-business property, at least for a few miles. These roads are very wide - sized for the huge trucks and other machinery that is used to plant and harvest in this area. 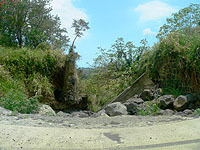 Since this road is actually an old plantation road, it has been used for years to transport sugar cane, macadamia nuts, and other crops. Turning right at the first junction continues you past the water tanks and into a forested area. At about 2.0 miles you should cross a small bridge and at about 2.3 you the tree line should begin to thin. As you continue up the road you are ascending to about 2,000 feet. 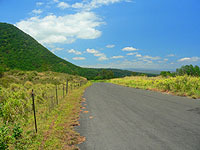 As the vista opens up you should have good views of beautiful and lush cinder cones on the mauka (mountain) side of the road. 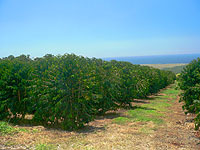 Between the 2.3 and 3.0 mile marker, on the makai (ocean) side of the road is a spectacular Coffee planting. These great specimens were 6 to 7 feet tall some with flowers, some with bright red, ripe cherries (the ripe bean) and some with the young, immature green bean. At the 3.1 mark there is a T in the road and we decided to get off the main road and explore this rather wide side road. We marked our odometer at this point and continued down the side road. At about the 4.2 mile marker we encountered a detour sign as the road became rough dirt. Taking the detour we rumbled down into a dry streambed and back up the other side, taking note that the detour was there due to a bridge that had been washed away. Just after we came out of the streambed there was another junction with a cheery sign that read Rest Cloud Coffee Farm. Curious, we took this junction: row after row, field after field, of coffee plants. 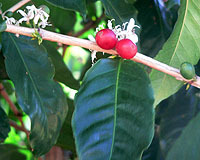 Many of the fields had workers hand picking the ripe cherries for drying and roasting. This road basically dead ends after about a mile or two, but it is interesting to see the fields of coffee growing happily under the Ka'ū sun. We turned around and went back to the coffee farm junction, made a right and continued to explore. Besides the coffee farm, much of this area is planted with fast growing trees that will be harvested for lumber. This area is basically a grid intersected by roads that go around and through the uniform forests. The day we drove around in this area was after a recent windstorm and there were many trees in the road, requiring us to have high clearance and 4-wheel drive to get over and around. However, most of the roads intersect to each other so eventually we found ourselves back where we started, and we went back past the coffee farm, past the detour and back onto the main road. Note that at this point we deducted the miles we took on the above excursion off the mile marks we made from that point on - so just assume that the rest of this is as if we didn't take the side road. Back to the main road the road is a pleasent drive from here to the 11.0 mile marker. On your right will be hill after hill, cinder cone after cinder cone. 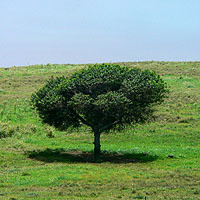 Many will have lush forests, others will be meadow. Much of this is cattle grazing farm land and you will see occassional herds of happy cows. Look for owls around here too, as they like to perch on the fences along the road. 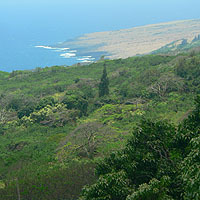 On the makai (ocean) side of the road, the land drops quickly away and there are often fantastic views of the ocean and distant bays. One of the small problems with this drive is that the grasses that grow here are rather tall, and most of the good views require one to stand on the sides of their vehicles or on tip-toes to see over the grass. However, in some of the more spectacular vistas it is obvious that people have made little areas that allowed them to get good views. Be careful, however, about making your own vista as the grass is very dense and the ground drops away quickly. 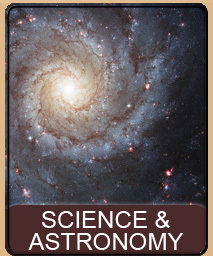 As you approach the 11.0 mark you will see in the distance a large round ball on top of a structure. This ball is also visible, sitting high on the ridge, from the highway way below. Being antenna enthusiasts (we always like to document unusual antennas and try to find out what they do) we often wondered where the road was that led to this area. Not only is the ball visible, but other antennas, some obvious microwave repeaters are also clustered up here. We were pleased to find that the road goes right by these antennas. At the 11.7 mark is the giant ball. 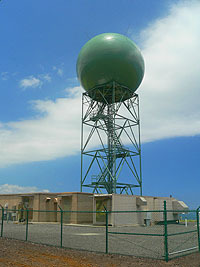 This is the southern most FAA radar and is used by the airport as a part of traffic control. Large warning signs adorn this building, as one would expect. The other antenna in the area are cellular and a variety of communication and telephone repeaters. 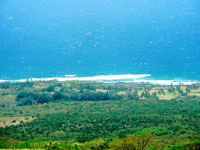 This area also offers great ocean views and on the mauka side - pasture land with cows and gentle blowing green fields of grass. At about the 12.6 mark the road meets a junction. The road you are on is paved and if you continue straight, it is dirt but at the T a right seems to be paved and continue on. 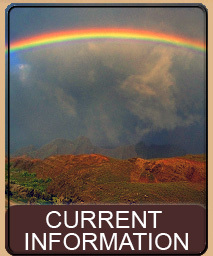 Intuition would tell you to take the paved road, since you're already on a paved road, even if it is narrower. Well, don't follow intuition. If you take the paved road you go for a bit more until it basically peters out into pretty hostile driving. Instead, take the dirt road that went straight onward, from the end of the paved road. 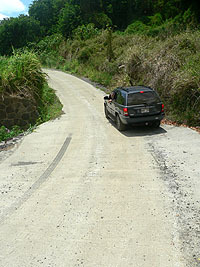 Even though the road is now dirt it is in good condition and maintains the original width of the paved road. No car should have any problem on this part of the road. As you go along here you will note that clusters of houses can be seen not only below you, but off in the distance as well. These houses are in Nā'ālehu and we are near the end of our drive. Continue to about the 14.0 mile mark where the dirt road takes a big dip downwards. Looks scary but it is really easy. At the bottom of the hill is a brand new cement roadway going right over a streambed. 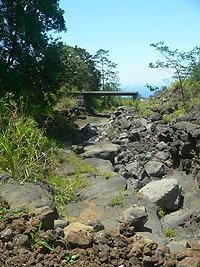 If you get out here, either side of the stream is a nice view and you can see, makai, the remains of a bridge that was washed out. Actually, we did this road about a year before this trip and the cement was not there and the road was washed out and required a 4-wheel drive. This is one reason we didn't write this drive up right away. But the road has since been repaired and can easily be driven by any car, making this a perfect afternoon drive. As you continue up out of the streambed, you go back up a small hill and then down and on your right is the Nā'ālehu cemetery. Go past the cemetery and you will be back out to the highway. 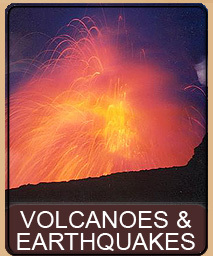 At this point, take a right if your going to Kona or a left if your going to Volcano or Hilo. Enjoy the rest of the trip. 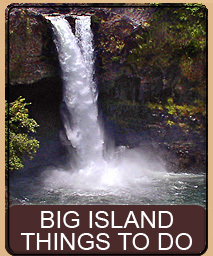 If you are heading back to Hilo be sure to look back up the pali as you can barely make out the road you were just on. 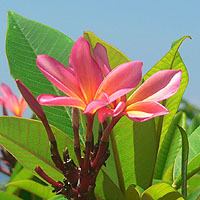 This page is named 'Drives.kaalaiki'. Can't Find It?